Volunteers at the Fayette County Memorial Hospital were treated with a thank you and recognized for service by the hospital recently. Nancy Troutman, auxiliary liaison, presented the group with gifts, snacks and recognized their efforts. Anyone interested in volunteering in working around the hospital or sewing with the sewing ladies can acquire an application at the gift shop during the week between 10 and 5. Volunteers in the front row, left to right, are Marilee Peterson, Jeanne Immell, Patsy Stevens, Carolyn Reinwald. Second row: L. to R. Mila Schlichter, Rita Brown, Ann Blake, Sharon Irons, Ruth Curry, Barbara Vance, Maxine Wolf, Suzanne Kidd. Third row: L. to R. Vicki Cardenas, Pat Gall, Joyce Lott, Beth Foster, Susan Mitchell, Robin Dolphin, Jean Ann Davis, Kathy Goldsberry and Nancy Troutman. https://www.recordherald.com/wp-content/uploads/sites/27/2019/04/web1_Volunteer-s-Month-picture-2019.jpgVolunteers at the Fayette County Memorial Hospital were treated with a thank you and recognized for service by the hospital recently. Nancy Troutman, auxiliary liaison, presented the group with gifts, snacks and recognized their efforts. Anyone interested in volunteering in working around the hospital or sewing with the sewing ladies can acquire an application at the gift shop during the week between 10 and 5. 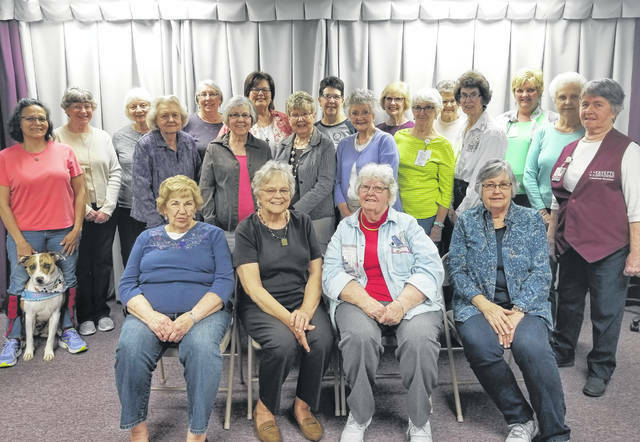 Volunteers in the front row, left to right, are Marilee Peterson, Jeanne Immell, Patsy Stevens, Carolyn Reinwald. Second row: L. to R. Mila Schlichter, Rita Brown, Ann Blake, Sharon Irons, Ruth Curry, Barbara Vance, Maxine Wolf, Suzanne Kidd. Third row: L. to R. Vicki Cardenas, Pat Gall, Joyce Lott, Beth Foster, Susan Mitchell, Robin Dolphin, Jean Ann Davis, Kathy Goldsberry and Nancy Troutman.